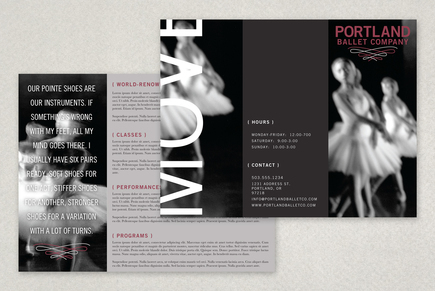 A ballet company could use this brochure to showcase renowned instructors, classes, and performances. The interior of the brochure has substantial space for descriptive text about the company. The large type with the abstracted black and white images reflect the tone of ballet in a contemporary and elegant way.